Auto turn signal shut off module is hard wire style. 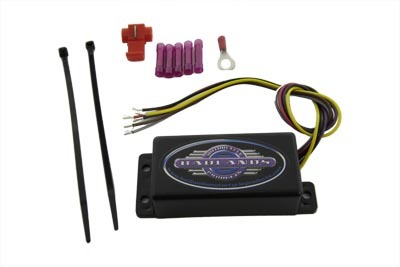 Use this module when you have removed your OEM speedometer to install a custom gas tank or installed a custom speedometer therefore losing the operation of the OEM canceller. This module will return similar features such as 11 second timed flashing that automatically cancels manually cancel at any time built in emergency flasher & hazard mode built in solid state flasher built in equalizer III functionality. Module runs LEDs or up to 70 watts per side and includes wire connectors & simple wiring diagram. Measures 2-7/8" long X 1-3/8" wide X 7/8" deep.